The practice of renting furniture instead of purchasing has proven to be beneficial for consumers. Gone are the days when consumers demanded a permanent ownership of products, goods and commodities. With the progress in design and style, consumers are considering the dynamic nature of trends. Leasing furniture is about providing access and comfort to consumers who feels that these services are about both saving money and convenience. Emerging growth of e-commerce sector has made the process more convenient and affordable for the people to rent the furniture by going through various online channels. The furniture rental market is expected to grow at a robust growth over the forecast period i.e. 2017-2024. The primary factor responsible for the growth is an increase in number of employers that are incorporating rental furniture’s into their corporate mobility policies as a core service offering. The practice of renting instead of purchasing furniture has proven to be beneficial for consumers because of lower price with reduced expense and maintenance which will drive the furniture rental market size. North American region has been consistently dominating the market globally, in terms of the demand for rental furniture. It is followed by Asia-Pacific occupying the second position in the market. 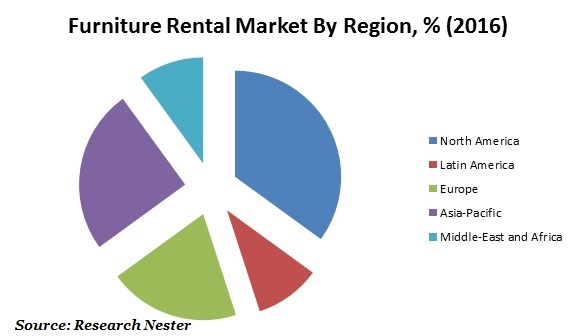 Massive growth in urbanization along with rising number of corporate offices is expected to fuel the growth of furniture rental market in Asia Pacific region. Europe is anticipated to showcase robust growth in the next few years. Rising number of working population and unevenness related to the settlement has prospered the growth of furniture rental market over the past few years. The urbanization and growth in the real estate industry is influencing the furniture rental market all across the globe. In U.S. the growing trend towards the rented apartments has been observed among the population who are inclined towards affordable, multifunctional and smaller furniture that suits their changing lifestyles. Moreover, the rental furniture service providers are trying to cater to the metropolitan ways of life of consumers and are adding appealing features to the furniture. Presently, rental furniture includes various attributes that are aesthetically appealing and light weight, and thus supplementing the growth of the global rental furniture market. Rising expenses coupled with changing lifestyle is expected to prompt the consumer towards rental furniture in the near future. However, the market growth is anticipated to be hampered by tracking rental furniture equipment availability, managing complex bookings and pricing models, maintaining furniture and delivering amazing customer service.